This is Aunt Marcia’s recipe. I don’t really like muffins but these were very good! In large bowl combine brown sugar, oil, egg, vanilla and buttermilk; mix well. Stir in rhubarb and nuts. Add flour, salt, soda and baking powder. Stir until moistened. 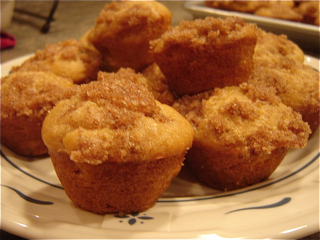 Combine topping ingredients and sprinkle over top of muffins, pressing down lightly. Bake at 350º for 20 – 25 minutes.